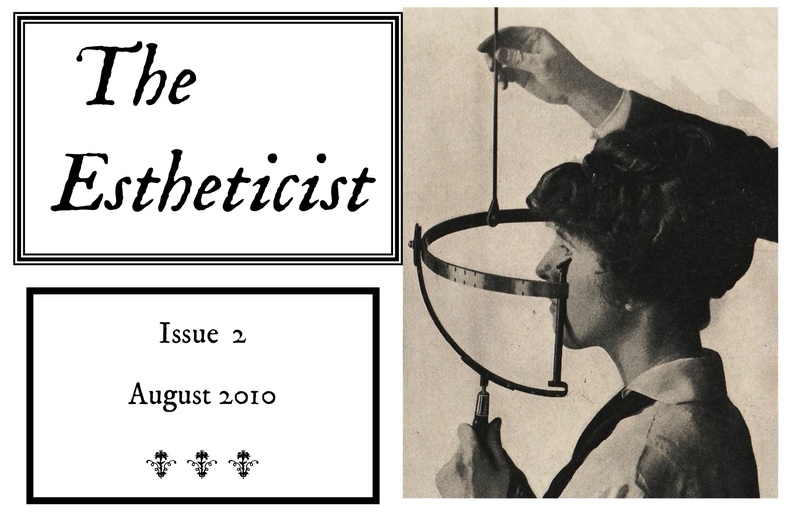 The Estheticist is a free ongoing service of art consultation around practical, philosophical and ethical issues around the visual arts profession. To ask a question, email estheticist [ at ] aol.com. Participants accept that their questions may be used for a printed publication that will serve as a professional development tool for emerging professionals in the arts. Your question will be confidentially and the question will appear as anonymous unless you specify otherwise. Recently I wrote a critical review about an artist. Just three days before this review was published, the dealer who represents this artist had invited me to submit an exhibition proposal for his gallery. I was very happy. However after the review went online, the artist told me that he and his dealer were very upset. I wrote to the dealer, but I never hear back from him. What should I do? You are experiencing the inconvenient world of trying to be both a critic and a curator (That’s your first mistake). There is a reason why critics usually don’t curate exhibitions and why curators shouldn’t spend their free time writing criticism— both things are not very compatible and I have yet to see someone who can pull both of them off spectacularly well. Now, assuming that your review was negative (since otherwise I doubt both dealer and artist would have been upset), it does appear hypocritical to dis a gallery in public while at the same time expecting them to open their space to you (second mistake). If they would indeed give you the opportunity and you did curate a show there, one couldn’t help but wonder how come you are willing to work with a gallery that you publicly hold in such low regard. Furthermore, it is quite understandable that if the dealer doesn’t feel supported from you he would not feel precisely compelled to support you in return. Not all of us are good Samaritans. I am afraid that there is not much you can do about this situation but to try to mend fences over time with the gallery. For starters, writing a positive review wouldn’t hurt. I need time to make art. I need money to make art. I need time to make money. not make art. How does this vicious cycle end? Thank you for your question. You are right: art takes time and money, but so does eating. Do you stop eating when you don’t have time and money? People who want to be artists but aren’t really serious about making art, use the money/time excuse as a cop-out for giving up on making art. The reality is that when art is absolutely vital for your life, you will find the time to make it. And while money certainly helps, it is not an absolute requirement, e.g. conceptual art. I understand, however, that your question points out to how to achieve a satisfying amount of time and money to make art. The reality is that most of us will never arrive to that point, but there are three things we can do to get there. One is to take the structures within the art world that allow artists with this problem to have enough time and sustenance to make their art. That is what residencies are for, and to an extent, graduate school (in some situations). Another thing you should do is to learn resourcefulness from people that are more disadvantaged than you. Most handicapped people don’t give up living because they have a handicap; they instead learn how to live with their handicap and sometimes even turn it into their advantage. You should take the potential of every limiting situation. If you run out of paper, can you find another surface to make art on? if you only have one hour each day, can you dedicate it to build a long term project? You are an artist: what artists do is to be creative and thrive the more things get tough. As an artist who does performance and interactive work, most of the stuff I make becomes known through documentation, and I am very good at that. The thing is that I can easily make documentation look like the original performance or collaboration was spectacular, when in fact it may have barely happened or not been successful. A friend of mine criticizes me for doing this, but I way that as an artist the concept is what matters and its my right as an artist to present whatever I want whether its fact or fiction. Am I correct? You certainly have the right to do and say whatever you like as an artist, in the same way that I have the right to say that I built a palace in the middle of the Amazon or that I fought in Vietnam. Your problem is that you are like a fiction writer whose audience thinks that he/she is a non-fiction writer. As such, you are just as good as your lies are. And while lying is key to art-making, if these lies don’t do much more other than conceal the defects of your interactive processes, then you better make sure that no one gets to see the actual events—ever (which I guess may be tough since theoretically I think you will need people to at least pretend they are interacting). Otherwise, the day they realize that what you do mainly exists in Photoshop you may find yourself that your career was also a fiction. Is it ok to make financial profit from art that is about social injustice? It is not ok for anyone to benefit from social injustice in any way. This is why there are laws that prevent criminals from seeking financial profit to, say, write books about their crimes. But to forbid an artist to sell a work about a particular social issue would then penalize those who are genuinely concerned on what’s happening in the outside world and instead reward those whose work avoids controversy. Furthermore, despite what you may hear, social causes can benefit from the work of those who call attention to it. In such situation the motivation behind each art project about a delicate subject must be interrogated, and until the full context of the work is understood it should not be necessarily condemned as a cinical strategy or praised as a heroic act. I’m 35, I have a solid resume, and for the most part I’ve been able to maintain full-time artist status (largely due to artist residency programs/fellowships) since getting my MFA seven years ago. My work is contemporary and conceptual, though not very marketable. I have been fairly successful with promoting visibility of my work, but I need more. How can I get a solo museum show instead of all these University galleries and non-profit spaces? How can I get nominated for grants like Louis Comfort Tiffany award, Artists Legacy Foundation, Nancy Graves Foundation? I realize the answer lies in needing my work seen by leading curators in the big cities- how can I do that? You certainly have lots of experience and developed a substantial body of work. And that, interestingly enough, is a problem in your case. Why? Because the way you brought yourself there was through residencies and the university gallery circuit. Which is great, but you must break that pattern if you want to move on. To use a very pedestrian, but accurate, metaphor, think about people who want to lose weight: no diet will ever work if it doesn’t involve a substantial change of lifestyle. In your case, my suspicion is that because you are so good at getting residencies and shows at smaller university and non-profit spaces you continue doing that with the fear that if you don’t do it then your career will end. It won’t. But it certainly is taking a great deal of time to you to attend all these residencies and producing the kind of work that one produces in a residency. I suggest that you become more selective as to the residencies you attend: only go to the best ones. Same goes for the small university shows, which at this stage in your career will do little, if anything, to boost your reputation. Plan a solo museum exhibition, even if there is no museum yet to take it: it is important that you start visualizing your work in that way. Then if your goal is to move to the next level, you need to set your views on the programming of the museums and institutions that produce them. That also means to become more familiar with the people around them and the things they debate and discuss. You may not have to move to New York or London to do this, but it would certainly help you more to make an effort to become more involved in New York than attending a few out of the way residencies. Make an effort to get out of there and build a resume of shows in Europe and other places. By showing an international profile will you likely become more visible to the people at home who make the decisions about the grants that you seek. And also don’t convince yourself that your work is not marketable: the reputational economy is just as important in the art world, and it is not dependent on whether you make sellable work. Is it important for galleries to participate in art fairs (Scope, Red Dot, The Armory show, etc.)? It this the “gateway” into the active art market? Assuming that the role of the gallery is to promote and engage the public, if a gallery chooses not to partake in fairs, aren’t they doing their artists a great disservice? Is it extreme to say that a gallery that is not included in fairs, simply does not exist? I represented by a gallery that does not participate in fairs, and has not sold any of my paintings. I barely receive correspondence from the owners. Am I wrong to feel under promoted? I do not mean to sound like a disgruntled art snob, but perhaps I am confused on the appropriate gallery/ artist relationship. Even having attended art school, I am still perplexed by the inner workings of the market place. Regarding galleries participating in art fairs: yes, it is important for them to participate in these events. There are a few galleries, however, who have a built clientele and reputation to an extent that they don’t have the need to be out there, but these tend to be very established galleries. For the most part, young galleries are expected to be active and maintain an international profile. Participating in international art fairs is the natural way to do it. Those galleries that don’t invest that way indeed end up going under the radar and remaining mostly local enterprises. So yes, it doesn’t help you as an artist if your gallery doesn’t take your work anywhere, but most importantly, if they don’t do anything to compensate that lack of support. It is telling when a small gallery doesn’t participate in any fairs: it means either that they have limited resources or ambition, or that they don’t have the cache to be accepted into the professional art fair circles. Either way, those are troubling signs. Second: the reason an artist works with a gallery is to have an advocate for the work that will promote it and introduce it to the market. If neither of those things are happening at all, then you may be better off without representation. No gallery is better than being represented by a bad gallery. And by letting yourself being represented by a bad gallery, you are preventing the possibility of a better gallery that truly relates to what you do to come by and take you on. I am an artist who is looking for a place to live. I have lived the third world all my life city and obtained an MFA. Now, I have the chance to do another MFA which is waiting for me in a first world city (Oxford), but I have no money to move and live there. The government and the art institutions in my country do not think I am good enough to invest in me. Should I go or should I stay in my current city even I have no friends, no fame (I don’t even want to be famous) not political affiliation, no institution that looks for me —so what would you recommend? ( the master program in this first world city is not even famous). What should I do? Go to this master in the first world, ask for a loan to the bank? work hard there? Please help! I believe your instinct to leave is correct, but you need to clarify to yourself what is it exactly that you are looking for. It also looks like you think that pursuing a second masters as your only escape route. Is it really another degree, is it to become a better artist, is it to get connected with the art world, or is it just to escape at any cost? Change is always desirable, but moving to another country to study at a place that you don’t even consider that worthwhile, and without money, can be a recipe for disaster. Not only you risk attending an unimpressive school, but you will expose yourself to very harsh financial sacrifices that will leave you in deep debt or will force you to work to an extent that your sustenance will take precedence over any learning experience. So, you need to leave, yes, but you’ve got to have a plan. It is true that master degree programs provide you with a structure from which to develop. But before you ask for a giant bank loan, what I recommend is that you consider other options than an expensive first-world masters from an undistinguished university— especially because you already have a degree. You may benefit more from doing three short residencies in cities with rich art life. You can apply to a residency and have a chance to get it all covered. The rent in Berlin is cheap and you would be exposed to a lot of great art activity. Buenos Aires is also affordable and the art scene is growing there. And if you don’t want to go to an art world capital, then you should consider going to a culturally charged place that would be a great inspiration for your work. If you do those initial short-term excursions, you may be surprised with what you find. Most importantly, you will have a chance to develop relationships in those places and it may help you in the future to do a more determined, and informed, move back there, or elsewhere. And maybe even, even if you don’t want it, become famous. Your ad intrigued me. I’m actually curious about what answer you give to your sample question: How DOES one enter into the biennial circuit? The answer is simpler than what you may think. People think that the genres of visual art are photography, sculpture, performance, etc. but that’s not true. That belongs to the XXth century. The XXIst century genres of visual art are: museum art, biennial art, gallery art, academic art, and so forth. Ok, I am exaggerating, but I hope you will get my point. To understand what I mean you simply need to go to museums, biennials, and galleries, and pay attention to the kind of work that is being shown in those places, and the way they speak to each other, and the way that curators build narratives with them (that is their own curatorial narratives). These works have certain characteristics. Works that enter museum collections are precisely, collectable. Works that exist in galleries are usually sufficiently self-contained that they can be easily collected. So-called “biennialist” artists, like gymnasts who go to the olympics, are those trained in the language of biennials, which tends to be more of the complement to what you see in museums: less collectible, more site-specific, more experimental, and yes, more spectacular. My point is that there is a sensibility in the exhibition conditions of the biennial that tend to be different from other places (that is, they usually happen in culturally-interesting cities that only on those occasions become the center of the art world like Venice, Istanbul, Sao Paulo,etc, they are visited by a sophisticated, usually more intellectual public than the one that goes to art fairs, they tend to be more about politics than about the market, etc), and artists who participate in these events are usually aware of these conditions, OR their work simply fits naturally within them and curators who select them recognize that. This is not to say that an artist can’t exist in museums or biennials simultaneously, of course, but in those cases their work has shown enough range that it can exist and function in those various registers. What is more important – To be a husband and a father and not a successful full-time artist, which means you may resent your children and wife. Or, to be a successful full-time artist with no love-of-your-life and no children? Some people will tell you that one has to sacrifice everything for art. This comes from the romantic cliché statement that all art must come from suffering. This idea was critiqued as early as the late XIXth century by Nietszche in “The Birth of Tragedy”, where he argues that in order to transcend nihilism one needs to balance Dionysian and Apollonian aspects of life. (Dionysian being closer to irrational, chaos and feeling, and Apollonian being closer to rationality, order and control). The problem that we usually face as artists, and as humans in general, is not understanding what fulfillment is all about. Yes, for an artist what appears the perfect picture of fulfillment is to have a successful career and have a family around who will care about you. But what is success to you, and is children and spouse the answer to happiness? Part of the problem, according to psychologist Mihaly Csikszentmihaly, is that we are too egocentric to understand what is good to us. Csikszentmihaly, who is a lead thinker in the field of positive psychology, did a thorough study of what makes people feel happy. He discovered that when we are the most happy is when we are in a state that he described as “Flow”, a kind of deep concentration where our ego goes away. If you were to translate this idea into art making, you may recognize the feeling of “Flow” in the process of making an artwork. The key is how to be able to arrive to conditions in your life that will allow you to reach a level of flow on a regular on the most frequent basis. These conditions will vary with every person: for some the stability of a relationship actually is beneficial for a successful career; for others, the emotional investment of a relationship is too distracting for making art. You have to find the combination that may best suit you. What you can be certain, however, is that the answer does not lie on whether you acquire only one or the other or both: it is on whether you can find the right balance or work and life to feel fulfilled. Is it possible to sustain a successful career as an artist, curator, and arts administrator all at once? Or is it necessary to choose just one? The answer is that while it is possible to joggle different functions in the art world, you have to eventually choose one. There are first the issues of profession and then the issues of perception. Let’s start with the professional part. First of all, being an artist is completely different than being a curator, arts administrator, art historian, critic or collector, because art making is not a profession: it is a way of life, a calling, that if pursued seriously affects everything else. Because of this reason it is possible to do side activities besides your art, but you have to never forget that your artwork is the central focus of your life. As you may know, some artists do curatorial work, but that is ultimately an incompatible activity the more you progress in your profession— you would eventually have to make a choice. Being an administrator, or an educator, is far more compatible, as you don’t are less likely to enter into the binary situations of exhibitions- either you are the one who gets exhibited or the one who curates the exhibition. Then we come to the issue of perception. Even when you are perfectly clear about the balance and focus in your career(s), the art world (and particularly the New York art world) has a hard time seeing individuals as fulfilling more than one function. In some small countries and cities, where there art scenes are smaller, it is more common to fulfill several roles, but ultimately again one thing has to give way to the others. You may undermine yourself when people see you doing many things at once— they either will assume that you are hopelessly scattered or that you are not serious about either one of the things you do. On the upside, because professional demarcations are somewhat artificial, it will serve you well to have experience in other areas, and more and more you can see individuals who are able to translate their expertise in one area successfully into another. But again, you will need to choose what is it that you really want to do and make sure people know that is your objective.